Today, NASCAR drivers always wear their seat belts, no matter what. In the 1940s, seat belts were not the norm in racecars. Some drivers used rope or aircraft harnesses to hold themselves in place while racing. By the early 1960s, most racecars had lap belts, and shoulder straps were added. For several years, five-point harnesses were the standard in NASCAR racing. The five-point harness, similar to those in child safety seats, was designed to keep the driver from “submarining,” or sliding out underneath the seat belt in during a head-on collision. In 2001, Dale Earnhardt was killed while wearing a five-point harness, so many drivers switched to a six-point harness in which belts are wrapped around each of the legs. In 2007, TxDOT partnered with NASCAR to convince Texans to buckle up. You can read more on the extensive equipment NASCAR drivers use to stay safe here. The seat belt originated as an idea invented by George Cayley, an English engineer in the early 19th century. However, Edward J. Claghorn of New York was granted the first official patent for the “safety belt” in 1885. 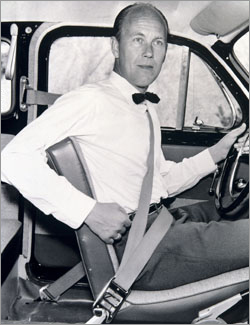 The first modern three-point seat belt, the type used in most vehicles today, was developed in 1955 for Volvo—who introduced it in 1959 as standard equipment. In 1985, a century after the original patent, Texas introduced its first safety belt law. When Texas launched its “Click It or Ticket” campaign in 2002, only 76.1% of the state’s population was buckling up. Today 93.84% of Texans buckle up… we’ve come a long way in safety! Posted in Techonology, Video | Comments Off on Use Your Head. Buckle Up.